I believe there are a few foods adults eat that confuse the dickens out of each and every child: olives, oysters and Fig Newtons. I mean, c’mon. Dessert is supposed to be sweet, loaded with chocolate and sprinkles, and icing all over, right? For me, Fig Newtons were the loser cookie – the one I would only eat out of pure desperation if there was nothing else resembling dessert in sight. But oh, how I loathed them! What could be worse than mysterious, brown fruit goo wrapped up in flavourless, dry “cake”? Yea, right. That’s not a treat, it’s a healthy breakfast disguised as a cookie, and for that I resented them. But funny how things change. If you were to put me in front of a dessert buffet full of overly sweet, cheesecakes, ice cream, and brownies nowadays, I might actually reach for the Newton. I mean, have you tasted these things?! They are delicious. Deep, dark, figgy jam filling and soft pastry. Not-too-sweet and so complimentary to afternoon tea. Kids, you are really missing out, but that is fine. More for us old people. Inspired by the fabulous fig jam I made a couple years ago, I thought I would revisit the awesomeness and try to use it in a cookie form. I realize that fresh figs are currently in season, but because I wanted to create a recipe that one could make all year round, I decided to use dried ones. I also made this choice because I wanted to add some liquid to the jam mix in the form of tea. Yes, you read that correctly. I am not so familiar with cooking or baking with tea and tea flavours, but I am on a rooibos kick these days and I thought that it would be a gorgeous compliment to the figs themselves. I was spot-on! With a little vanilla tossed in for added depth and lusciousness, this fruity filling makes an outstanding jam in its own right, so make extra if you want some to spread on your toast. Rooibos (pronounced ROY-bos) tea hails from South Africa, where it is has been cultivated and consumed for generations, while it is gaining in popularity in North America and Europe for its unique taste and numerous health benefits. Sometimes referred to as red ted, bush tea, or redbush tea, rooibos’s dried leaves are needle-like and vary in colour from deep red to caramel to a paler brown. The flavour of its tea infusion is warm, somewhat fruity and tabacco-y. It is decaffeinated and a wonderful alternative for anyone seeking to lower their caffeine intake. For this reason, rooibos is a perfect tea for children to enjoy as well. If you cannot find it at your local grocery store, look for it sold loose at health food stores and teashops. Figs, whether fresh or dried, are an incredibly healthy treat. It may surprise you to learn that eating just 3-4 dried figs per day, supplies the body with over 100mg of calcium. Calcium as we know is a necessary component in building and maintaining healthy bones, but it is also essential for supporting the functioning of muscles and nerves, and clotting the blood. Figs are also high in fiber, both soluble and insoluble. Soluble fiber is the kind that slows down our digestion, keeping us feeling full for longer. It also helps control blood sugar, and lower cholesterol. Insoluble fiber keeps things running smoothly in the bowel department. Figs also contain good levels of iron, potassium, manganese and vitamin B6. When buying dried figs, look for organically grown varieties, and make sure that they are sulfite-free. Sulfites are often added to dried fruits to prolong their shelf life and appearance, but many people experience adverse effects form these chemicals, especially those with asthma. 1. Brew the tea. If using bags, use two to make the tea very strong. If using loose rooibos, use at least 1 tablespoon. Boil ¾ cup (175ml) and pour over the tea. Let steep for 15-20 minutes, then remove the bags or strain. Take out three tablespoons and stir in 1 tablespoon of chia seeds, set aside to gel. 2. To make the dough, blend 1 cup of rolled oats in a food processor to make a rough flour. Add coconut sugar, baking soda, salt, and cinnamon, and pulse to mix. Next add the coconut oil, chia-rooibos gel, maple syrup, and vanilla extract. Pulse to mix until the mixture forms a ball. Turn out onto a sheet of plastic wrap, cover tightly and place in the fridge to chill for at least one hour (this can be done a day ahead if desired). 3. To make filling, roughly chop figs and place them in a small saucepan with ½ cup brewed tea, lemon juice, salt and scraped vanilla seeds, including the pod. Cook over low-medium heat until the figs start to break down and the mixture thickens (about 10-15 minutes). Add more tea or water if necessary. Let cool slightly, remove vanilla pod, then blend in a food processor. You can make the filling as smooth or chunky as you like. The filling can also be made in advance, if desired. 4. Remove dough from fridge, place on a piece of parchment paper and lay another sheet on top. Using a rolling pin, roll dough out until the dough is a little larger than 4.5” x 11” (12 x 28 cm) To make a rectangle trim off any excess dough around the sides. Spoon fig filling along the center, then fold in both sides and press lightly to seal. Cut 10-12 pieces out and place each one, seam-side down on a parchment-lined baking sheet. 5. Bake cookies in a 350°F/175°C oven for about 20 minutes. Remove and let cool completely. Enjoy. Fresh figs are in season here and getting dried figs without sulfites a bit difficult. Any ideas on how to modify these to make with fresh figs please? 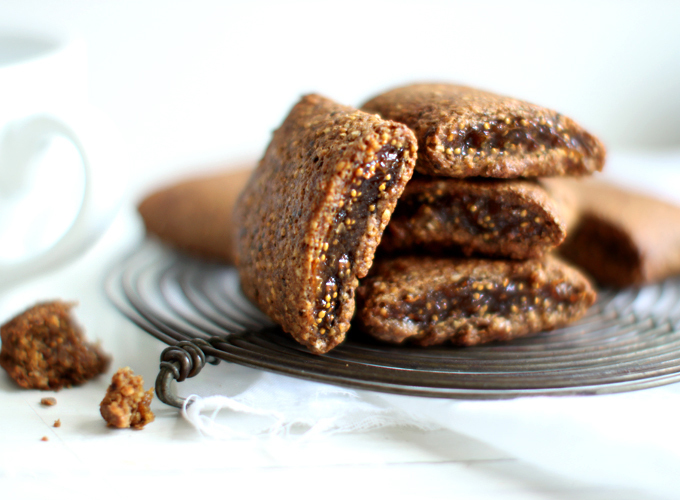 Can these be made with fig jam instead or making a new batch with dried figs? I feel like I’m missing a step in the newton process- won’t the jam/filling leak out the sides of the cookies if left open while baking? I’m allergic to anything “Maple” can I substitute Agave syrup? Just made them! (I know that 10 pm is not a time for sweets but…) I swopped half oats for buckwheat flour. They are incredible! Why people buy cookies at supermarkets when they can make something much more delish by themselves? Can the oats be replaced with any other (gluten-free) substitute i.e. coconut flour. A lot of your recipes contain oats, and I am not sure whether these can substituted for people with a sensitivity towards oats. I too am sensitive to oats, even the gluten-free certified kind. Are there any other suitable flours to use? These are totally out-of-this-world delicious! Thanks so much, Sarah B! I may not know newtons from my childhood, but I do know that these little treats are like really yummy! I made them so often for different occasions and my friends keep asking me for more and more! The funniest thing is even that one of my girlfriends, who’s not really into such “vegan” or “healthified” stuff, loves them so deeply, that when I mentioned they need chia-seeds, she admitted to even order chia seeds just for the purpose of baking these “cookies”! Horray! Right now I am already in the middle of preparing another batch of these, so I can gift them to her, only will I be playing with the shape a bit. Perhaps I’ll smear the filling on half of the dough and put the other half of rolled out dough on top, straightening things out and cutting them with cookie cutters in Christmas shapes! Christmas newton sandwiches! I love these! I’ve made them three times now, and I’ve switched to making a double batch (a dozen are eaten just way too quickly!) It’s very satisfying to make a cookie that looks so attractive and tastes so good…and it’s relatively healthy. I have not had the problem with oiliness, but I use the weight measurements for the dough and not the volume. I like the draw my rectangle on the parchment paper so I know how far to roll the dough. It can be sticky but that usually happens when I roll it too thin. The dough is pretty forgiving though, and pieced-together dough will come together and bake up nicely. I’m really looking forward to your book! March 2015 seems a loong way off right now though! 1) The comments on the coconut oil being too much were spot on. I reduced the oil to 2 tablespoons for a sticky but workable dough. 2) The cookies were too sweet. I’d reduce or eliminate the coconut sugar from the dough next time. 3) I’d prefer a smoother texture for the dough; next time I might try with spelt. 4) I only used about half the fig jam for this recipe – I have no problems with this though! I appreciate you sharing this informative article article.Genuinely hunting forward to browse extra. Definitely Excellent. These were even better than the “real” Fig Newtons! And I found them surprisingly easy to make despite some other reviews! I will be making these again and sharing the recipe with friends! Thank you Sarah for creating such wonderful recipes and lifting our spirits with your great blog!! Wow Sarah, these are outstanding. They certainly brightened up a dreary January day in Ireland. I had a little filling leftover and I am looking forward to adding it to my porridge in the morning. Thank you once again for sharing your amazing talent. I so did not think the dough was going to work…. But it did. Too sweet for me as I’m usually sugar free, so I’d try them without honey and sugar too. Figs are sweet alone! I definitely think that 5 tablespoons of coconut oil is too much. Or maybe there is not enough flour. As others have said before me, my dough was very hard when it came out of the refrigerator, then it stuck to the parchment paper. When I put the cookies in the oven, they “melted” in large oily puddles … Cookies eventually cooked and solidified, but they are clearly oily! In addition, I really felt like I missed a step because I had at least twice the amount of filling necessary for the amount of dough. Mine were oily too but SO GOOD. In my opinion they were definitely more of fig ‘cookies’, not something i could justify for breakfast-but did anyway! My little brother said he would eat them for breakfast and he hates breakfast! So , super tasty, which if you are looking for a crispy fig cookie, the oil is a must. Love the recipe just made today followed the recipe but found it was too runny and wouldnt mix to a ball so added some more oat flour for a stiffer consistency. Dont know what went wrong. Anyway turned out fantastic. Made these last night after many other recipe successes from your site and you didn’t let me down! I kinda poured the batter into the fridge, but when I rolled it out between two bits of baking paper it was firm and worked well. During the baking I thought the pastry was a bit sweet and the filling a bit tart, but during the eating I thought it was just perfect! So delicious. Next time I think I’ll make double. I see in the comments below that someone else also posted on this, but in my opinion, 5 TB of coconut oil is too much. The dough was saturated with oil, and cooling it for an hour turned it rock hard. I decided to triple the recipe (not the oil) to balance out the 5 TB of oil, adding a little more tea/water to moisten the dough. After doing that, all was perfect. Now I have three times the amount of delicious vanilla rooibos fig newtons. Thanks for the delicious recipe!! I just discovered your blog by googling “fig newton recipe”. I’ve already tried two recipes from your website, and I must say that the newtons are simply amazing (not being vegan, I used butter instead of coconut oil). I’ll keep coming back for more recipes! wow…I **LOVED** these. WIll double the batch next time. THe dough was very sticky and hard to work with, but I managed…could it be because my coconut oil was melted, not solid? My apartment is always humid… THank you for sharing these recipes. This is the 2nd thing I’ve made from your blog and both have been amazing. I came upon your blog via Pinterest. I already tried some recipes and are looking forward to try this one. As an Afrikaans speaking South African, I just want to add that the word Rooibos is Afrikaans for Red Bush. As far as I know the word Rooibos has been registered as a trademark for tea produced from the red bush. In any case, it is delicious and I am glad the rest of the world gets to taste it too! I work for a company called Numi Organic Tea and one of my coworkers made these for our team the other day with our rooibos. They were SO DELICIOUS! Thank you for the fun and inspiring recipe! I made these and they were to DIE for! I even fed them to my non-health-food-eating friends and they were into them as well. Thanks so much for the amazing recipe! So excited to have a cookie I can make for my boyfriend’s 5 year old that are a healthier choice! Thank you! Made these on the weekend with a few subs – stevia for coconut sugar and mix of apple cider vinegar and lemon esscence instead of lemon juice – only because I couldn’t be bothered to go to the shops. Oh my they were delicious and made my house smell amazing! Next time I will cook them when it’s not 40 C and swealtering and I will love them even more! Thanks for a great recipe. My batch is baking in the oven right now. The size for the dough seemed a bit small – or I had too much filling. Either way, I ended up with 8 enormously wide cookies, so I cut them in half and an anxiously awaiting them to bake and cool so I can share with my son. The scraps I tasted were delicious! Thanks for sharing! Just to clarify, is the chia gel made with 1/2 cup of the tea or the 3 tbsp taken out of it…..? Hmm. Interesting combination of flavors! I like fig newtons, so I’ll have to try this recipe when I have the time. Thank you so much for this recipe, just made them and they are perfect with a hot cup of tea. This is coming from a sugar addict — with recipes like this, I may never need to turn to sugar! Just wondering, how do I store these for maximum freshness? Countertop, fridge, freezer? Please let me know! Thanks for another (soon-to-be) delicious recipe! These look fantastic. Seedy little figs are my favorite dried fruit. I was happy to find a 2 lb bag of organic sun dried figs at costco for $10. Might have to try these. 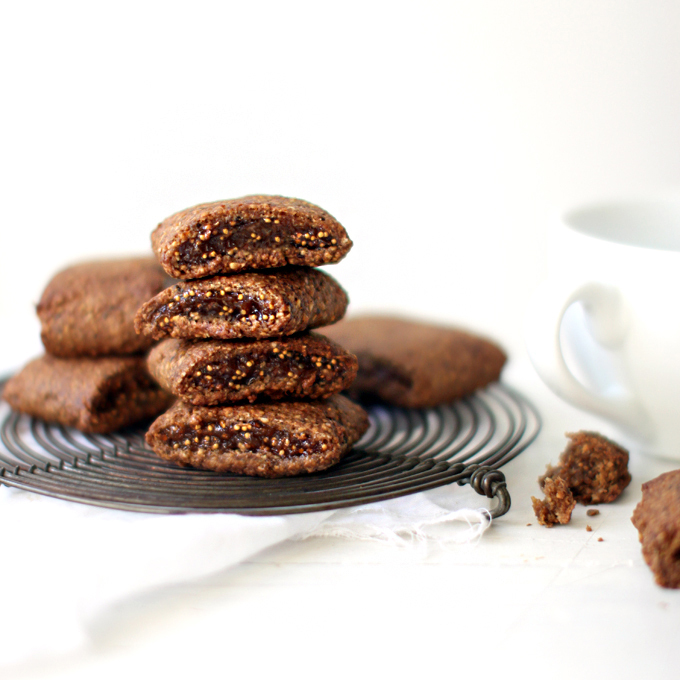 Finally made these, definitely one of the best healthy cookie recipes EVER! I don’t have rooibos tea and I’m dying to make these! Are there any other tea’s that might make a good substitute? I have black, green, white, earl grey, earl grey with lavender, chamomile, apple cinnamon, vanilla chai,etc. Thanks! Oh my, Sarah, these are AMAZING. I made them on Sunday for some friends we were having over for dinner and all four of us AND our two little ones were obsessed with them!! I tried a swipe of the dough before they baked and I was amazed at how delicious it was. I couldn’t believe that something with so little sugar could be so sweet and yummy. The dough that got cut off the edges I turned into little balls that I baked next to the newtons and I was in love with those too!!! That is my new favorite dough!! I love all your recipes, but this time you seriously knocked it out of the park. It was just more delicious than I could have imagined. Thanks for sharing your talents with the world so freely!! Wow, these are so good! I loved the first batch I made with figs, but the next time I was out of figs so I used frozen blueberries and dried apricots instead. The filling was a bit runny, so I thickened it up with some chia, and all those little chia seeds made it reminiscent of the fig seeds. Delicious! In the history of the world, there has never been a better cookie. Whoa. I think I was a tad reckless with the coconut oil (melted from solid), so my dough was just a little loose after refrigeration, so I spread just a wee bit of flax meal and it worked well. Can’t wait to make them again. Thank you, Sarah. I made these today. The dough is amazing, very much like snickerdoodles. I didn’t have quite enough coconut oil so I used 1 Tbsp of canola oil… it made it too soft and they spread out in the oven. So stick with the coconut oil or butter. But it did make the edges crispy, which was pretty tasty. I also substituted flax seeds for the chia, and that seemed to work just fine. I think I would double the recipe in the future. First, we ate about half of them immediately. And second, there isn’t enough filling to work well in a standard size food processor. Twice as much would work well. And would make enough to last more than five minutes. Thanks for a great recipe, Sarah! Oh for the love of figs. YES. oh my goodness….this is soooooo yummmmmy & delicious…how do you make such mouth watery things! Ha! The loser cookie- perfectly put. Although, now I truly enjoy fig newtons; not too sweet and, of course, because they are brimming with figgy-ness…WOW, I really am getting old! how to stay healthy : we can live healthy by our atmosphere should be neat and clean. we should clean regularly our locality. Then we can live healthy. Hey, I preferred Fig Newtons growing up : ) (maybe it was the tea and Fig Newtons w/ mom made them that much sweeter to me)! I find that Fig Newmans now are more like the cookie I remember. Thanks for this really beautiful recipe. It looks like it will be really fun to make. Wow! What a fun recipe! I just posted a recipe for Rooibos Infused Wild Rice on Monday. Fig newtons are hard, but so worth it. Can’t wait to try your recipe! Big fan of the blog! I second the comment above! Mine also spread a bit in the oven so I wrapped a bit tighter with my second batch . My picky 3 year old loves them! A great ” road trip” snack for us. Thanks Sarah! Made these and loved them! My pastry became a little sticky towards the end of rolling it out and I found it hard to separate it from the baking parchment when it was time to fold over the filling. I would suggest flouring the baking paper lightly to stop this happening. Apart from that wee hiccup, the end result was fabulous and delicious. The pastry is as light as air but with amazing texture. The filling (I added some finely chopped dates) is perfectly sweet and caramel-like. Perfect for breakfast with thick Greek yoghurt! Oh, and I added the maple syrup to the pastry…is that correct??? Thank you Sarah, for yet another lovely recipe. I made this crust and put in the fridge overnight and took it out to bake it but I didn’t realize the coconut oil would make it harden so much. I didn’t have time to wait for it to warm up so I just cooked it as is in a big 5×7 clump with sliced pears and cinnamon on top. IT was delicious! Would you suggest next time that I let it thaw for an hour if it’s been in fridge a long time? You are wonderful, I can feel it through cyberspace. These look incredible. Can’t wait to try them! Well, HA! I was just thinking this morning that I wanted to make some fig newtons and would look for a recipe, wished that I could make them gluten-free (for my daughters family), sat down to the computer, opened your site and VOILA! Talk about a magic lamp! Thanks so much. Going to make these today. They look like perfection – both in appearance and taste. Thoughts on using palm sugar instead of coconut sugar? Beautiful blog, pictures, recipes, comments, blogger… You really inspired me! Anon – No, you cannot leave the chia gel out. It acts like an egg and binds the dough together. Very important! Candice – coconut sugar is a low-glycemic alternative to sugar. You could use evaporated cane juice instead. Chuck – holy cow. I am obsessed with your substitutions. Brown butter?!?! You are wild and I must try that too. yum! This is delightful! I love fig newtons and am so excited to make these! I just made these with a few of substitutions: browned butter instead of coconut oil, apple cider instead of rooibos tea, 1/2 tbsp apple cider vinegar instead of lemon juice, and 30 grams honey instead of coconut sugar. I mixed the maple syrup with the dough at the same time as the chia jell. I think you forgot to mention in the directions when it’s supposed to go in the dough. I was a bit skeptical when I first mixed the dough, it seemed very loose. However, chilling it for 2 hours made it consistent and easy to roll. Verdict: pretty damn good! Thanks. Those look yummy! I have a question for you because Im confused whether coconut sugar is good or not. What can you tell me about it? Hi! I have great organic dried figs here and was looking for a good idea how to use them because they are getting a bit “sugar-coated” which is why I don’t like them in my “muesli” anymore. Are the chia seeds important? Can I just leave them out? Thank you very much for your help and your great blog! Johanna – the coconut oil and sugar don’t taste like coconut. But you could technically use butter and brown sugar (gasp). Anon – I haven’t tried this with any other grain. Give it a shot if you like and let me know how they turned out! I am literally salivating waiting to finish the recipe, but need to know soon so that I can refrigerate the dough in time!!! LMK!!! Never once have I craved a fig newton…until this post! These look amazing and I love that you put rooibos in both the dough and the filling. Yum! These cookies look delicious! I would love to try them, but my husband doesn’t like coconut 🙁 can I just use some other oil and sugar? W to the OW these are seriously stunning. I can’t believe how good this sounds! fig newtons are terribly good, but this sounds like a really wonderful upgrade. thanks! I was so excited to see this recipe. I love fig newtons! I can’t bring myself to eat the ones at the store and have been wanting to find a recipe I could make at home. I can’t wait to try these. Thank you! Thank you! Thank you! God, that looks amazing… I have to yet it…yummi! Thank you! So I just had to Google ‘Fig Newton’ – here in the UK they’re just called fig rolls. And I’m pretty sure children love them! I certainly did. My sister and I even made a little song, ‘The Marriage of Fig-a-roll’, can’t remember much but it ended with ‘oh crumbs’. Ha. I was one of those peculiar children who just could not get enough olives, smelly cheeses and fig newtons. Cannot wait to try making them myself. And with rooibos too! Your flavour combinations are always so inspiring Sarah! Haha! I also used to loath Fig Newtons as a kid. But when I was back in the US in 2005 I had one & all of a sudden all of the flavours came together in a quite tasty way. Thanks for this lovely recipe! I live in South Africa and I love rooibos tea. We son’t have fig newtons, but I’ve heard about them and yours look delicious. I’ll definitely make this recipe sometime. So glad to hear that rooibos and dried figs are a good combo. 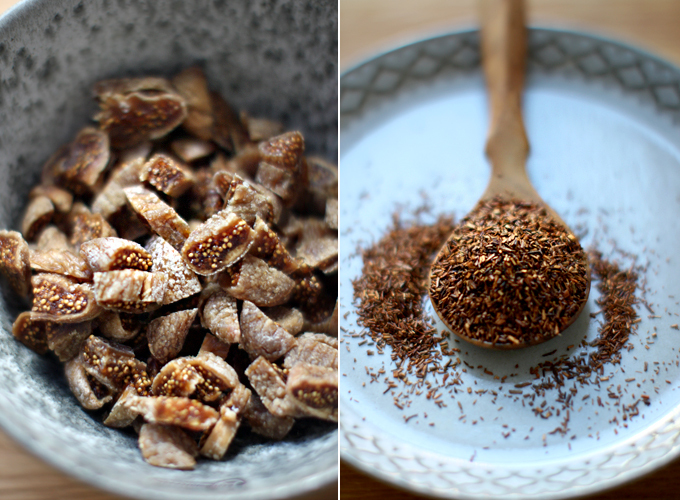 I was creating a fig recipe earlier this month and soaked the figs in rooibos chai. Epic fail! I was so disappointed cause I was sure rooibos and figs would be a fabulous pairing. The chai spices must have been what wrecked it. I’ll have to try to adapt your recipe to be grain-free as I can’t eat oats or other grains and I used to love fig newtons. Anonymous- Im coeliac, and GF oats aren’t appropriate for many coeliacs, try using quinoa flakes, or semi-ground buckwheat maybe? Your recipes are literally jaw-dropping. I look forward to them so much! Not to mention your engaging writing. Best blog ever. Seriously. I can’t wait to make these, thanks for the recipe. Fig Newton’s (or something similar, we don’t call them that here) have always been my favourite, but in my family we were a little gross and called them squashed fly biscuits since that’s what the filling looks like! You know you’re my hero right?! Just pinned this! 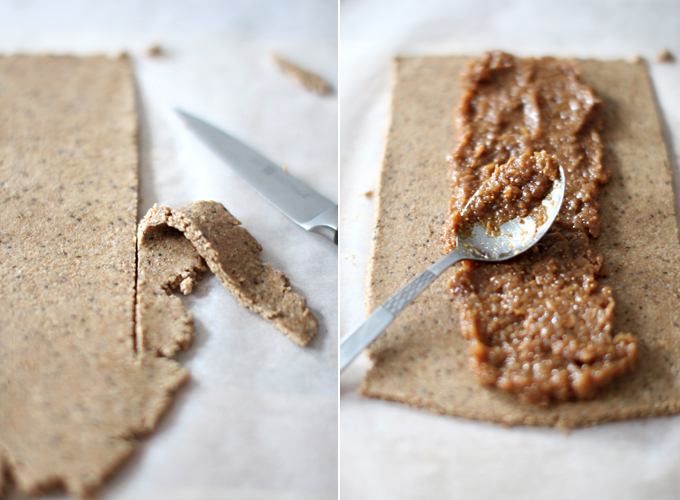 I’ve been using coconut sugar in my baking lately, too– so flavorful! And I like the addition of chia to this recipe. It’s my new fave ingredient in the kitchen- love the crunch and the nutrition. I have never had a fig newton in my life growing up in South Africa but love rooibos tea (and am currently drinking my evening cuppa). Will definitely have to try these. So happy you’re excited to make these…they are seriously yum. LOVE fig newtons and these look even better! Using rooibos in the dough is such a great idea! I look forward to trying these. These look delectable! Thank you for sharing. Wow. These look awesome. I literally JUST started a GF trial and I’m already nervous about the holidays- my mom always makes fig cookies and they’re hard to resist. But I think these are going to be an awesome way to continue the tradition without the gluten. Thank you!!!! Wow!!!! As a HUGE fan of Fig newtons I have to tell you that I’m really happy about your recipe!!!! These look so yummy. I just happened to be looking for a recipe for some dried figs, and this is it. Can’t wait to try them! Hi sarah – thinking of adding these to my christmas hampers this year.. how long do they keep in the pantry after they are cooked? These look amazing! I love a good fig recipe. Seriously, Sarah. How do you do it? Only a truly great chef makes every recipe better than the last. That is you! I love this recipe. Will definitely try this recipe with rooibos. OMG these are gorgeous! And they sound so delicious. I love the rooibos spin. Luckily, I loved Fig Newton’s growing up. But the healthy version my mom always bought, not so much. Nor olives and oysters…yuck.